5Allenzplus: The power of a Thank You- note. It's been on my to-do list for month's. I owe them to a bunch of people. People who brought meals, gave rides, watched the boys and visited me at the hospital. 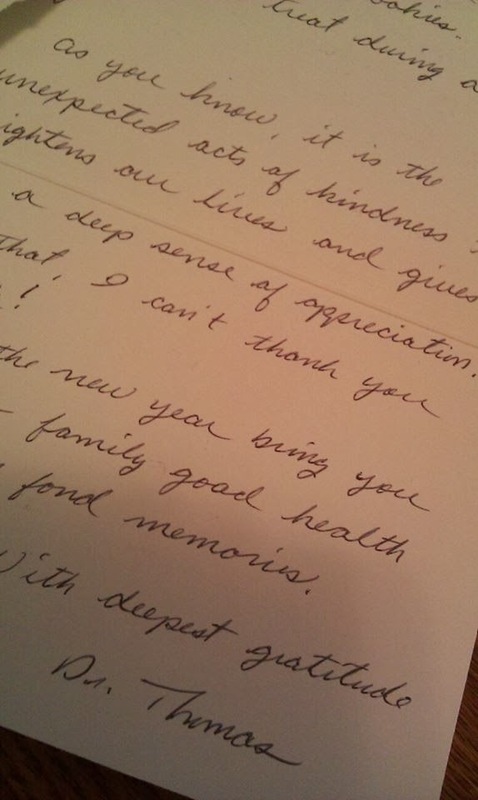 Does a handwritten thank-you note matter? After all, we say thank-you at the time of the act or gift, right? And then, in the midst of my guilt and wonder, I got it. A hand written thank you note from my surgeon. Yes, my surgeon. A beautiful expression of gratitude for a few sugar cookies. Then I started wondering - when do you send, or not send a written Thank-You? So I went straight to the Internet, and thankfully, Emily Post has the answers. So, if you're in doubt, go ahead and send a note. It might just make someone's day. Guess I better get busy.